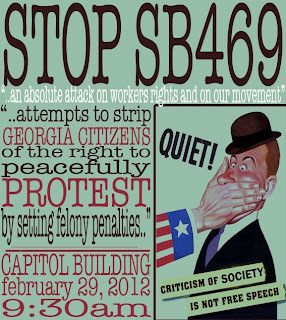 Today marked the first day of public action against Senate Bill 469. 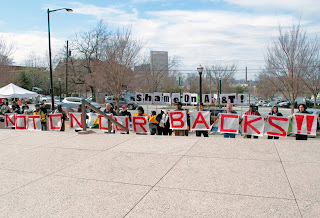 A group of folks from Occupy Atlanta among other groups gathered at the capitol and again later in front AT&T to oppose the bill and shine light on it's shadowy or gins. The bill was introduced by Don Balfour (R-9th),Bill Hamrick (R-30th),Bill Cowsert (R-46th),and Ross Tolleson (R-20th). All four Senators are members of an organization called the American Legislative Exchange Counsel(ALEC). 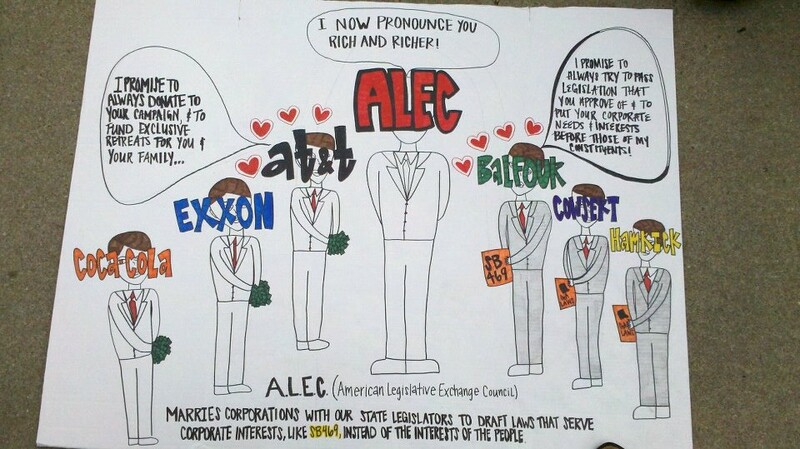 ALEC basically brings lawmakers and corporations together to draft model legislation. Law makers pay $50. every two years to be members of ALEC while corporations pay $50,000 a year and additional large sums of money to be a part of one of the nine ALEC task forces. ALEC claims to be nonpartisan but the fact is that it's also funded by several right wing think tanks. Law makers are given scholarships to attend luxery conferences with their families. At these conferences corporations vote on model legislation and refine the language of potencial policies that elected officials associated with ALEC are charged with the task of introducing. ALEC writted legislation is passed one out of five times. The lastest piece of ALEC wriiten legislation , SB 469, would make it a crime to organize sit ins, fine individuals for picketing($1,000 per day), and fine organizations who support a picket($10,000 per day). While many in the general public have commented that the bill appears to souly focus on pickets outside a residential home, it should be noted that the bill simply includes residential homes in the language. ALEC was also responsible for the anti-immigration bills that swept the nation last year, HB 87 in Georgia. Why would ALEC be interested in anti-immigration bills? The Corrections Corporation of America(CCA) is a ALEC member. CCA stands to profit billions of dollars to inprison undocumanted Americans if bills like HB 87 continue to sweep the nation. To CCA undocumented Americans make more profit locked up in a cell then they do working, and US tax payers pick up the tab. At every turn it seems ALEC represents the worst kind of wealth consolidation in this country. We encourage folks to call the sponsors of ALEC legislation on let them know that we will no longer allow them to put the needs of wealthiest corporations over the needs of the 99% of us that create their wealth. In the AFSC tradition we regard no person as our enemy. While we often oppose specific actions and abuses of power, we seek to address the goodness and truth in each individual. We are called to confront, nonviolently, powerful institutions of violence, oppression, and injustice. Such actions may engage us in creative tumult and tension in the process of basic change. We seek opportunities to help reconcile enemies and to facilitate a peaceful and just resolution of conflict. 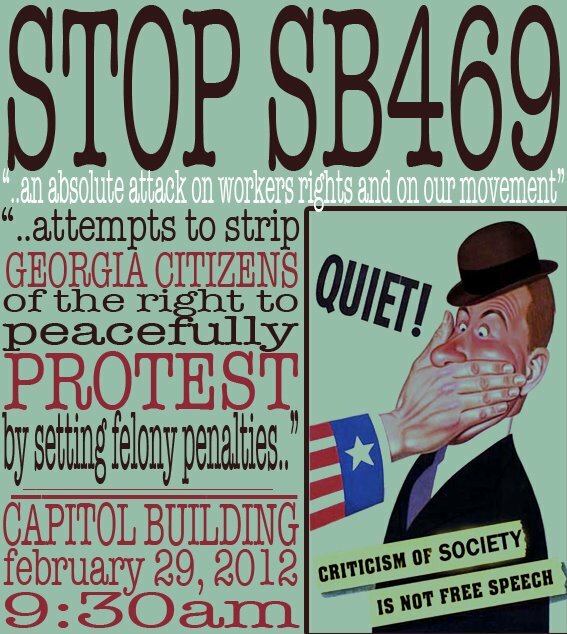 Last week in Georgia, Senate Bill 469 was introduced, and it has captured the attention of the nation. If it passes, it’s likely to open the door for similar legislation. Why is the AFSC community moved to express deep concern with this bill? We live in a time of unprecedented wealth disparity. All over the country, unemployment, foreclosures, homelessness, and a bevy of other social concerns have driven thousands into political engagement. What we are seeing is a totally new section of our population rising up against injustice in their communities, and in many cases reclaiming power. Senate Bill 469 seeks to dismantle not just people power, but constitutional rights, and human rights as well. The Bill would make it illegal to picket or protest outside of any non-governmental building. Those that choose to participate in a nonviolent picket could be fined $1,000 per day, and organizations, like AFSC, that supported such actions could be fined $10,000 per day. 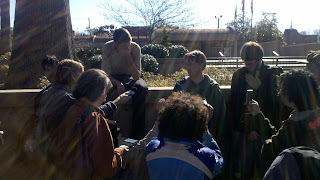 To make matters worse anyone who is involved with planning civil disobedience actions that result in a criminal trespass charge (this is usually what the charge is for nonviolent sit-ins) would be charged with felony Conspiracy. 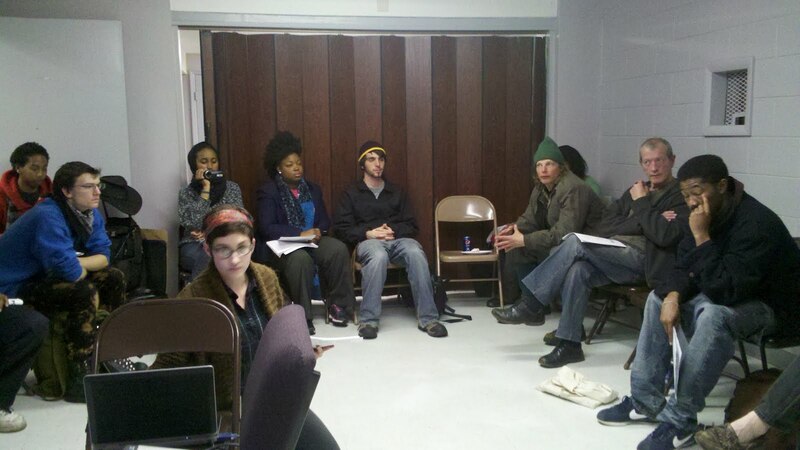 Under the law AFSC staff, volunteers, and interns who facilitate nonviolence training for groups in the Civil Disobedience(CD) planning process could be charged with felonies whether they participated in the CD action or not. More troubling is the origins of the Bill. The Bill was introduced by four Georgia Senators, all of whom are members of an organization call the American Legislative Exchange Council(ALEC).To be a member of ALEC lawmakers pay $50 every two years; corporations pay $50,000 per year, and they pay thousands more for every task force they want to be on(there’s nine different task forces). ALEC holds three big conferences a year and dozens of smaller regional/statewide meetings. The conferences and meetings are always super exclusive and law makers are usually given scholarships along with their families. It’s widely known that AT&T is one of the heavy hitters on the board of ALEC. 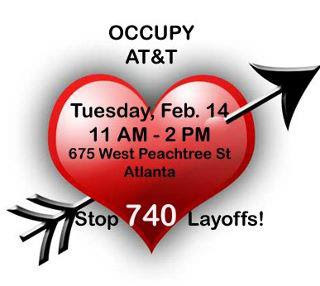 SB 469 appears to be a direct response to coordinated actions by Occupy Atlanta, Atlanta Jobs With Justice, and Communication Workers of America to stop AT&T from layoff 740 southeastern employees. 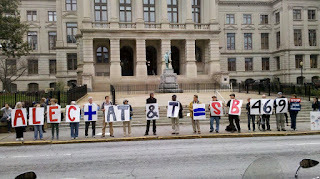 AFSC Atlanta challenges members of the Georgia Senate to ensure SB 469 does not pass. We regard no person as our enemy. While we often oppose specific actions and abuses of power, we seek to address the goodness and truth in each individual. 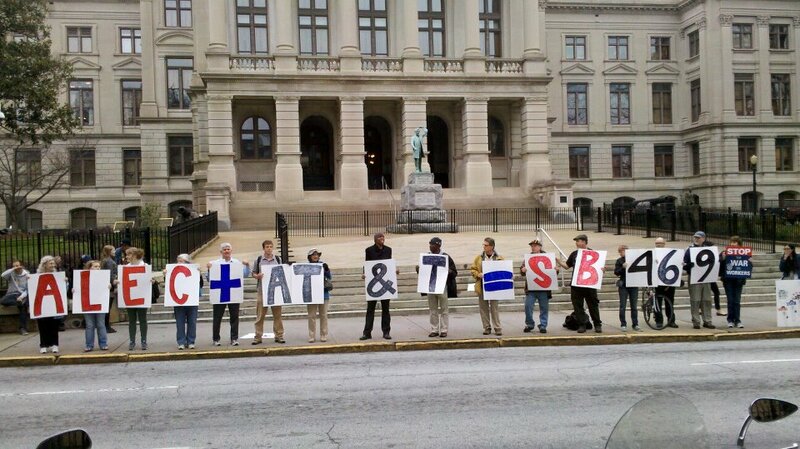 Many who live in the Atlanta area plan to converge on the Georgia Capitol at 9:30am sharp and then again at 12pm in front of AT&T at 675 West Peachtree street.You can also call the sponsors of the bill and ask them to reconsider their support for a bill that would have made a felon out of Martin Luther King Jr.
On day eleven of the corporate occupation of AT&T about 25 leaders of various faith traditions came together to pray, contemplate, and express deep concerns for AT&T’s corporate greed. Why are they concerned? 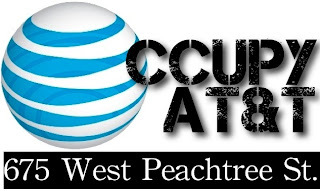 AT&T made record profits last year, had the resources to compensate their CEO to the tune of 27 million dollars, yet they plan to layoff 740 unionized workers in the south east despite the fact that AT&T customers constantly complain that service is slow. The interfaith service was held on AT&T property and it appeared that AT&T executive staff didn’t have the nerve to ask folks to leave the grounds; they were of course invited to join, as several AT&T workers did. After the service we passed out hundreds of fliers, put out new signage, and had a visit from the National Action Network, all by 1pm! We continue to add a tent every day, making our total today 24 tents. 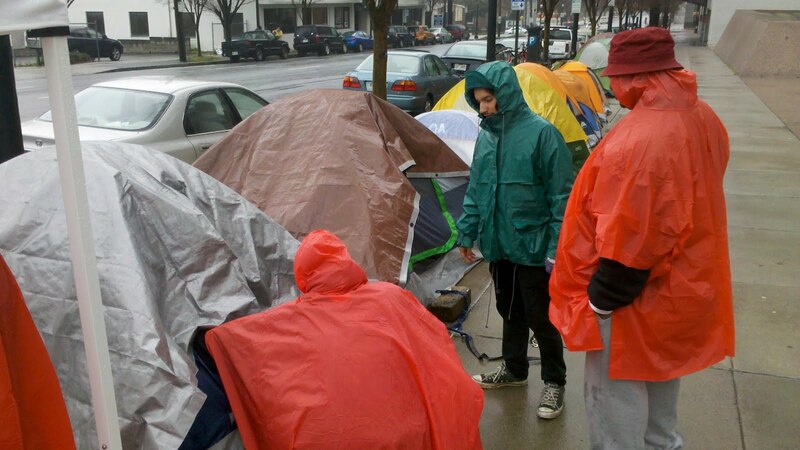 We could definitely use more tents, and occupiers of tents. As the weather gets nicer will you commit to join us for a night or two each week? Can’t camp? That’s okay! There are many ways you can plug in! 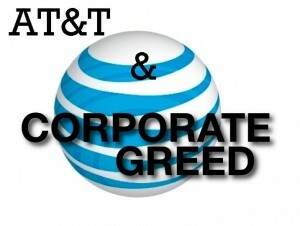 *Pressure at&t to do the right thing! 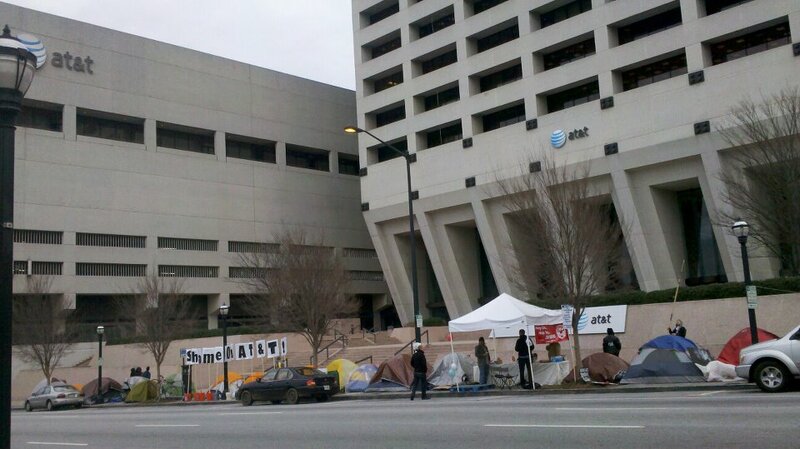 Today marked nine days since the Occupation of AT&T's Atlanta HQ began,and everything seems to be growing. From public awareness to the number of people camping, things are definately moving. They morning kicked off with email blasts around the country asking folks to call/email AT&T and tell them to rescind all layoffs. 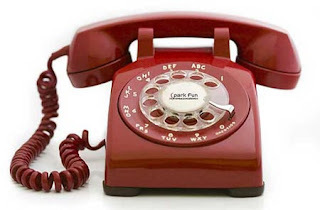 I know that by 1pm Michael Mathews phone, AT&t's VP of labor relations,had taken so many calls is was simply ringing endlessly. Our plan for the day was to serve breakfast to workers who were showing up for a really tough meeting. There where meeting scheduled at 9:30am and 1:30pm for workers to recieve their layoff packages. 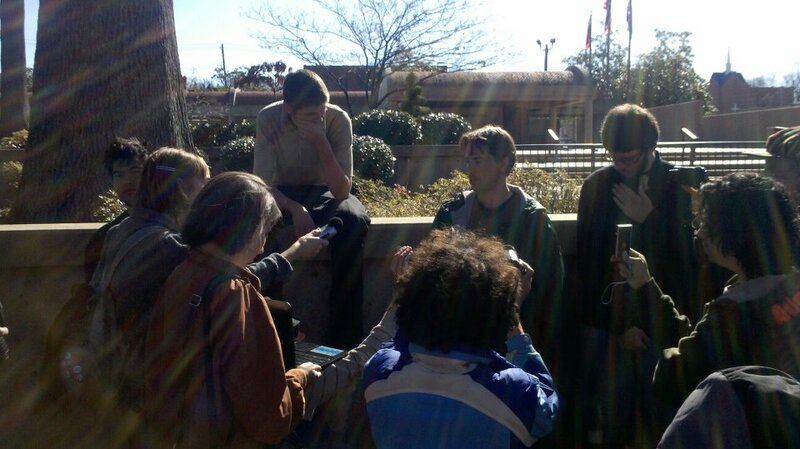 At noon we held a press conference with some of the workers who felt safe enough to give interviews. 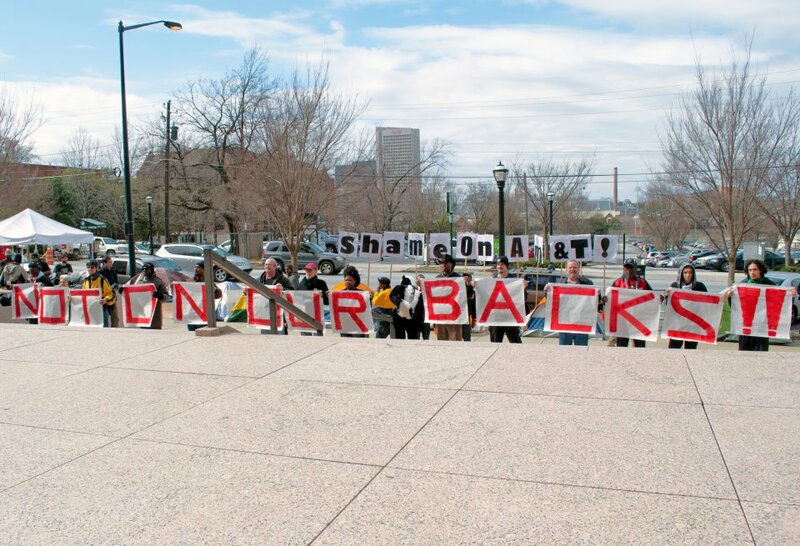 After the press conference we decided to take AT&t'S courtyard to send a clear message, "Not On Our Backs!". America's working class has been on bended knee for too long. It is time to draw a line in the sand and straighten out our spines. 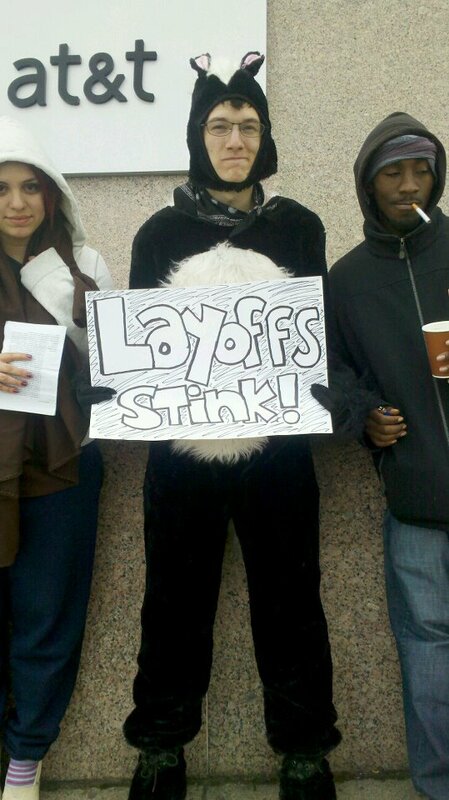 Atlanta, and the rest of the country for that matter, can't afford layoffs, especially from companies that are pulling unthinkanle profits year to year, corporations that insist on compensating CEO'S to the tune of 27 million at the cost of 740 working class jobs. This practice of discarding workers like trash is unaccptable. Together we can turn the corner and regulate corporate greed. AT&T is an important forst step for us in Atlanta. Help us send a message to corportate Atlanta that we can't afford one more layoff. 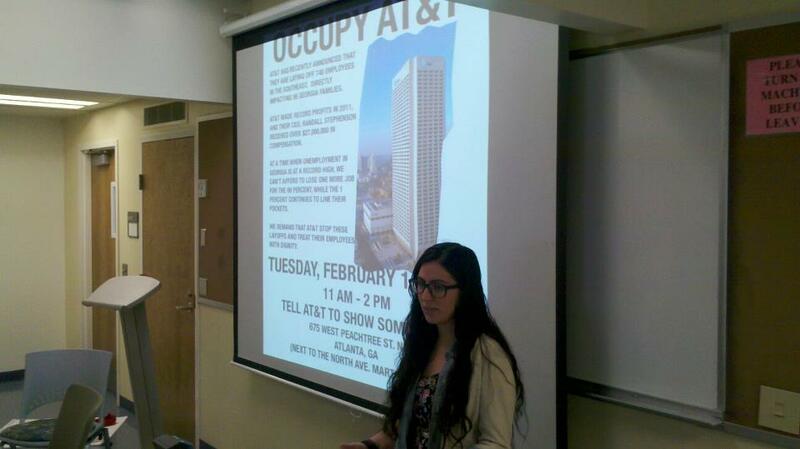 Today AT&T workers have been summoned to a meeting at AT&T’s Atlanta headquarters, located at 675 West Peachtree St. It is there, in this meeting, where they will be given notice of their official layoff date. Being told you are being laid off is almost always devastating, but in these economic times it can be downright terrifying. With unemployment, foreclosures, and homelessness at record rates, being jobless in this city is no easy feat. To add insult to injury, AT&T had record profits last year, pulling in over $127 million in revenue, and compensated their CEO, Randall Stephenson, over $27 million. Tony came to our newest camp today for the first time. He had been missing from OA for over a week. We found out why today. Tony's story is inspiring, but not unique. Everyone finds something different in an occupation. Tony found freedom from addiction. 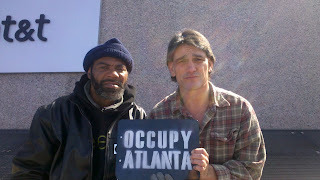 Tony is part of a growing number of shelterless people that have found recovery from addiction through Occupy Atlanta. They all say that the sense of purpose and duty give them the inspiration to get help, and be a part of something. 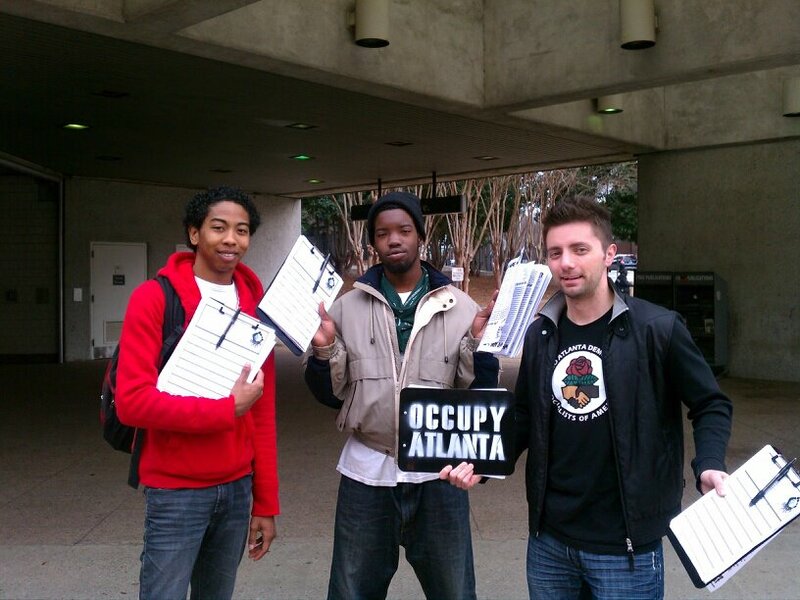 For Tony, and others, Occupy Atlanta is a starting point. 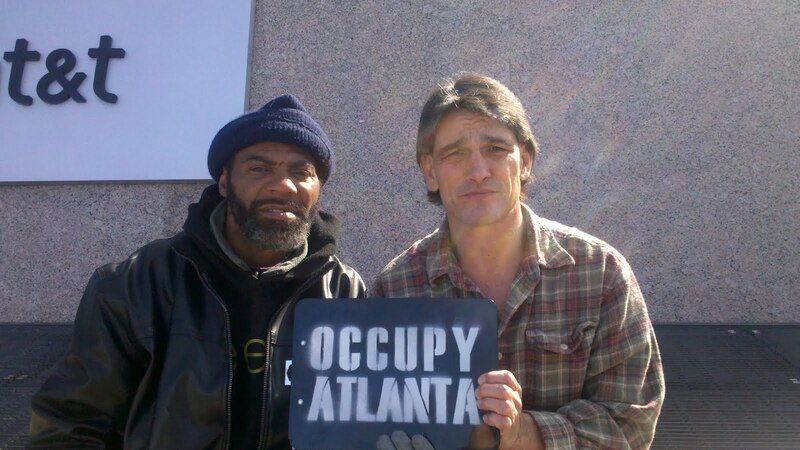 Most of them seek out other help from support groups as well, but Tony and Copper both say that Occupy Atlanta is what gave them the strenth to fight their addictions. This Wednesday at 5pm at the AT&T occupation(675 west peachtree st) there will be a 12-step recovery meeting for anyone that wants to join in. Several occupiers have expressed an interest in creating more space for this sort of thing. All are welcomed! 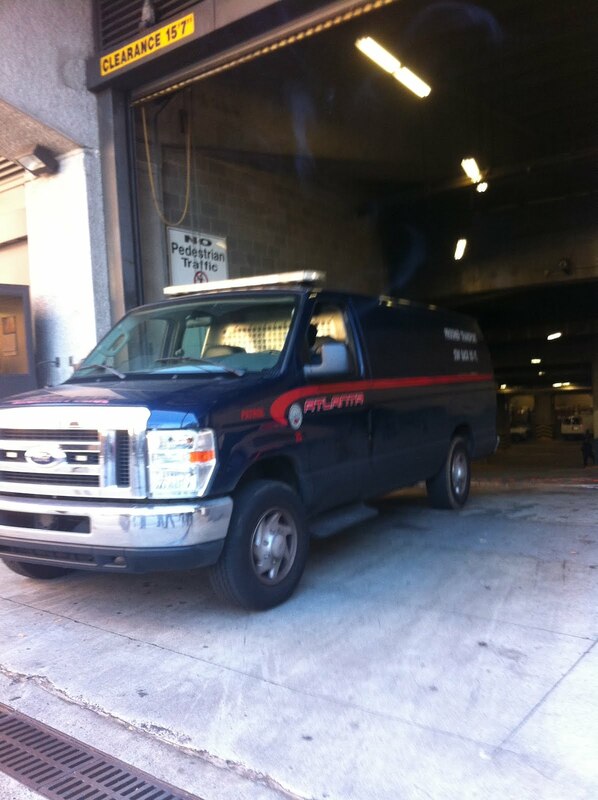 This weekend brought cold weather, lots of rain, and very windy conditions to 675 West Peachtree street. For those that don't know 675 West Peachtree is the Atlanta HQ for at&t. 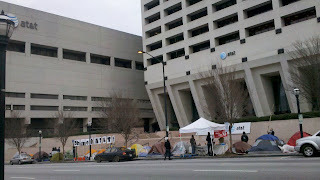 Occupy Atlanta has had an encampment set up since last Monday, and plans to stay until every job cut is rescinded, all 740 and forty of them. I had the pleasure of being one of the campers this past week and I plan on continuing to spend each one of my nights there.Last night the weather was especially brutal, several tents got flooded. Despite the tough weather occupiers spirits seem high. The work ethic I've seem has been impressive. Folks get up everyday, go flyer, some stick around and clean camp, create new signs. Yesterday a crew of folks hit Marta all day and got a ton of riders to sign petitions to rescind layoffs. The community support is exciting too. This weekend there was a number of sold out shows at the Fox theater so countless folks walked through the camp, most of them were supportive and many took literature explaining why we were there. One really exciting aspect of this occupation is the collaborative efforts of many different groups supporting the occupation. Communication Workers of America, the Teamsters, Grandmothers for Peace, and Atlanta Jobs with Justice have all made key contributions to this effort. Camping, feeding, and making sure everyone's warm. Can't forget to mention American Friends Service Committee. We've been providing all the printing costs so far, sign making material, and other valuable resource. For those in the Atlanta area please consider stopping by 675 West Peachtree. We especially want folks out Tuesday(2/21) from 9-2pm. Each day new tents and new occupiers show up! It's really exciting to have folks come out and camp who have never done anything like this before. 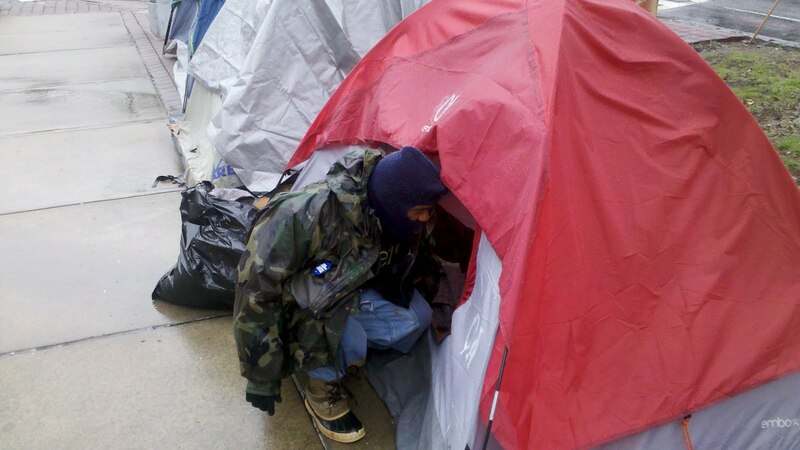 We already have several organized workers camping with us, and this weekend Local 3204 CWA president plans to pitch a tent. Exciting stuff. 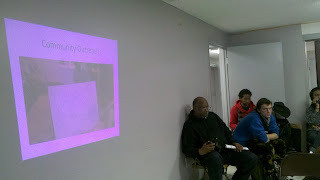 Last night Occupy Atlanta brought home owners and activists together to learn more about using the Occupation tactic to win back their homes. 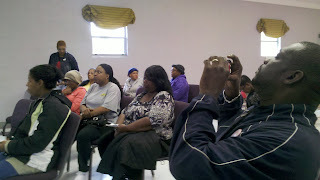 This year foreclosure are expected to be on the rise, Atlanta alone will likely have over 100,000 foreclosures. Meanwhile our homeless population continues to grow towards 10%. It's time to explore new ways to resist this epidemic of banks robbing houses. Over the next few months Atlanta will see more and more home owners standing up to the banks the very finnacial institutions that caused our economic meltdown. 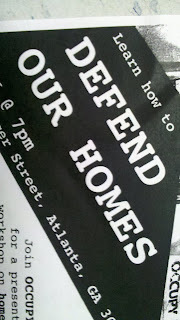 Homeowners, renters,workers and activists uniting to occupy our homes. Housing is a human right, and there's plenty of resources to go around if we work together, if we learn to think about more than ourselves. We can make Atlanta better, more fair, more just. We can do this! It was early December when AT&T employees in the South East received a letter thanking them for helping the company make record profits. AT&T racked up so much cash that they were able to pay their CEO, Randall Stephenson, over 27 million dollars! Just six days later AT&T workers received a second letter, informing workers that 740 good paying Union jobs would be cut in March of 2012. 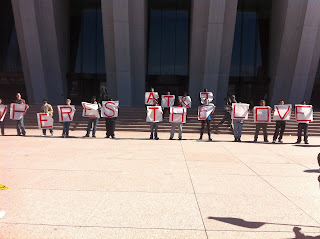 An interesting way of thanking the very group that makes AT&T super rich, it's workers. 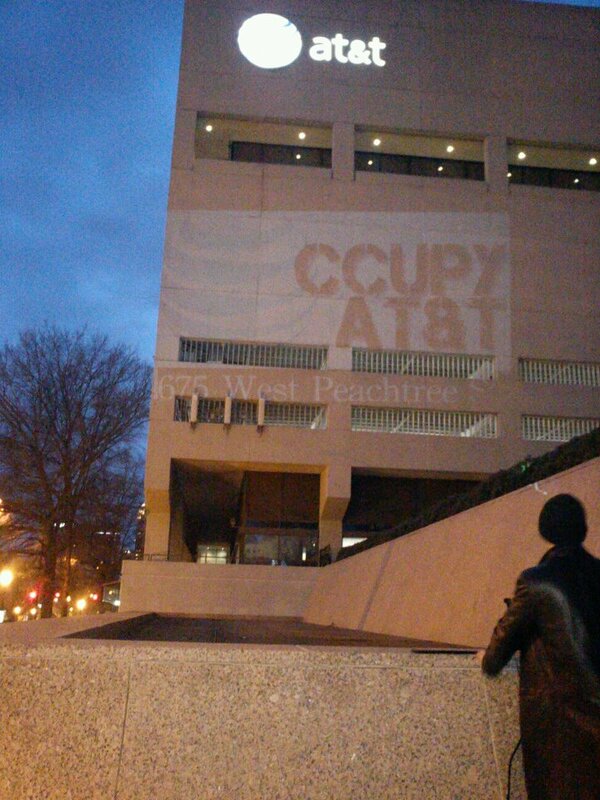 Yesterday AT&T experienced a surprise invasion of their Atlanta headquarters. At 12pm, the worlds largest communications corporation , twelve of us enter their building with one simple demand; resend all layoffs, all job cuts. We were willing to talk with whoever,but it was stated plainly that we would not leave unless a commitment to the 740 Union jobs under threat was made. 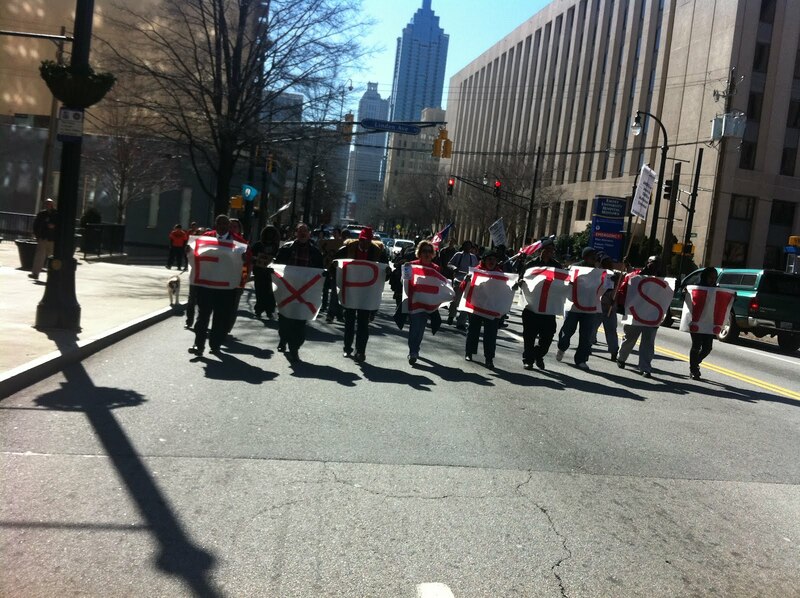 About ten or fifteen minutes later about 100 Occupy Atlanta and Union members showed up on the outside of the building with signs and tents! 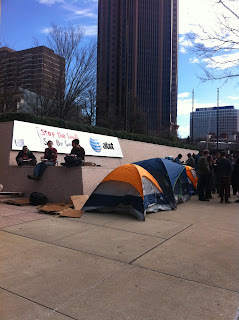 As AT&T executives grappled with what to do with us, sixteen tents were being set up on the sidewalk in front of AT&T. 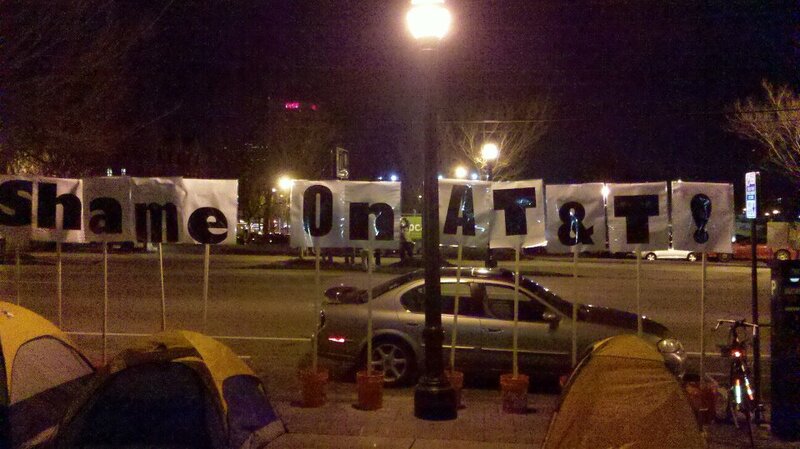 That occupation comes with the commitment to stay until AT&T resend all job cuts. Close to 1pm the police threatened those of us on the inside with arrest. 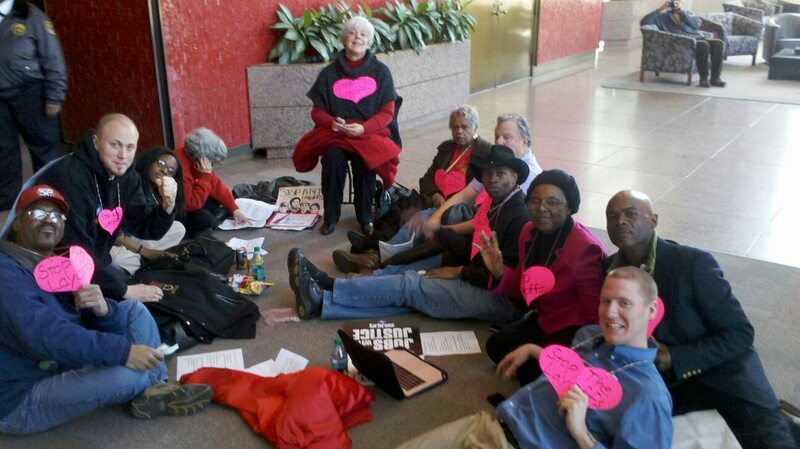 We decided to circle up, doing our large heart necklaces we made over the weekend, and sing slightly remixed love songs. It was only a few minutes later that we were arrested, taken to the basement of AT&T, put in police vans, and driven to Fulton County jail. It was a proud moment for me. Of the twelve we had two retired AT&T workers and CWA members, we had folks from Atlanta Jobs with Justice,Occupy Atlanta, the Teamsters,and of course AFSC in the house. The group represented to kind of alliances we need to turn the corner on the crisis of economic priority that continues to lift up those who already have an overabundance, and push down everyone else. I got out of jail early this morning. I've just read the press coverage of Monday's action and took notice to AT&T's response. They claim that many of the 740 laid off workers will be given job offers. This is probably true. The problem is that they will be offered jobs that pay considerably less, have no bargaining rights, and have little or no benefits. Workers should never be forced to go backwards for a company that's reporting record profits. If AT&T really were struggling, which they aren't, they should consider taking a chop from the top as a first resort. Monday's action confronted one of the roots or America's(and the globe for that matter)unprecedented wealth inequities. Perhaps we will wake up one day to a world that's had enough corporate greed. Perhaps we'll grow tired of a world that rewards those willing to build their life on the shattered dreams of their brothers and sisters. Imaging a movement that will not allow workers(profit creaters) to be exploited and discarded, a movement that physically stands in the way of those that create wealth at the cost of human misery. Imagine the unstoppable force of workers, students, the unemployed, shelter less, the Churches working together side by side to demand with their feet a more just world. AT&T recently announced the “surplus” of 740 union AT&T jobs despite their revenues soaring to $126.7 billion and a CEO that made over $27 million in 2011. Multinational Corporations like AT&T have been undermining workers standards of living for decades. If we stand up for union jobs with AT&T we can stand up for a future where there's enough for everyone; a future that creates space for all of us to thrive. Lift up the South, lift up this nation. Let's not get it twisted, there's enough resources to go around. The crisis isn't about resources, it's about economic priority. 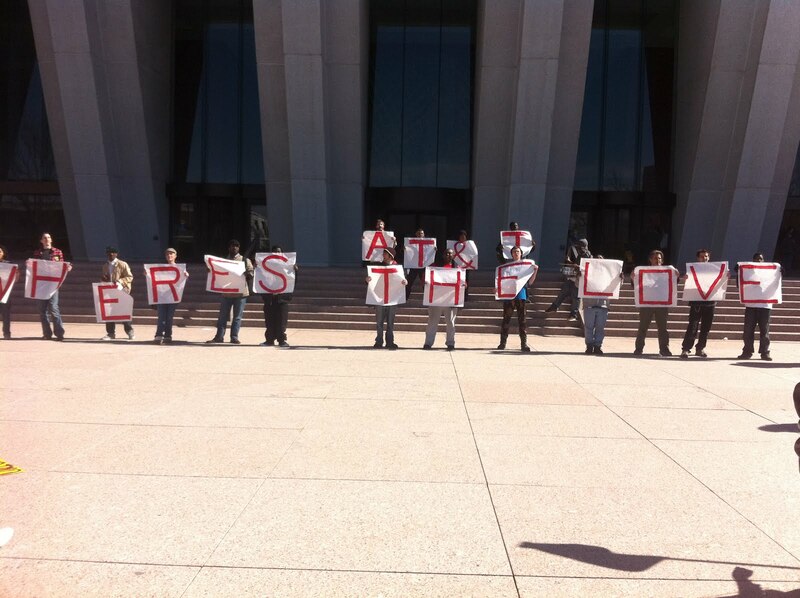 It's time that the 99% stand up to the unprecedented wealth consolidation that has been robbing our communities. Together we can take these 740 jobs off the chopping block. Let this action be the beginning of a movement to put human need above corporate greed in a very real tangible way. It’s time to bring the energy from Wisconsin into the South and it’s time to unite the Occupy movement with concrete worker struggles across the country. 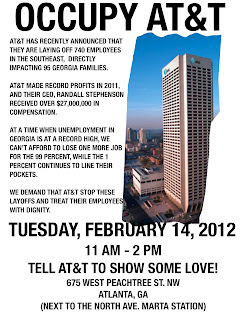 AT&T has announced that they are laying off 740 workers in the SE region, directly impacting 95 Georgia families. This is despite the fact that they made record profits in 2011 and their CEO recieved over $27,000,000 in compensation. At a time when unemployment is at a re...cord high in the state of Georgia, we can't afford to lose one more job. We demand that AT&T stop these layoffs!! Communication Workers of America(CWA) has called on Occupy Atlanta to stand with them and fight AT&T. We know that less jobs means more foreclosures, evictions, and homelessness. Bottom line, we can't allow corporations to discard workers so easily, especially when they're making record profits. This promises to be a different kind of mass action, creative, sprited, and nonviolent. We need all out on Valentines day! 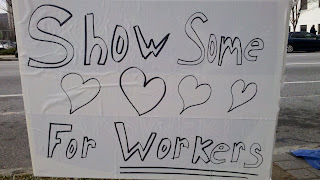 Show some love for workers!! American Friends Service Committee is excited to support this potentially historic action. 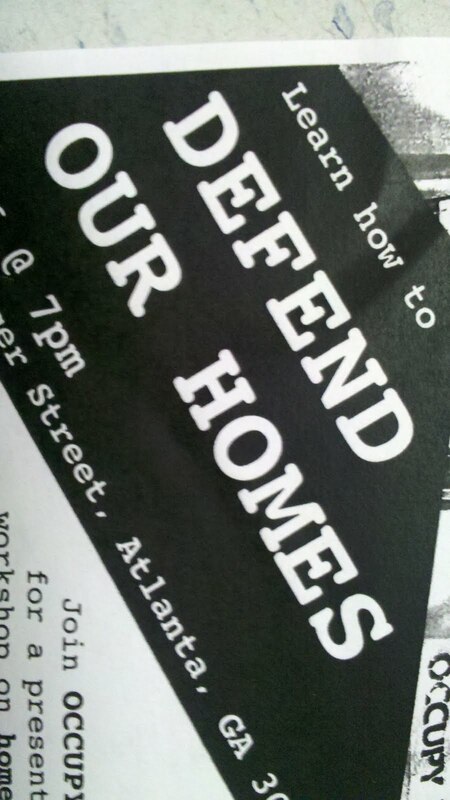 We'll be providing direct action training, video documentation support, and other imortant resources. Please consider supporting this event with your attendance, You can also contribute to the Occupy Atlanta legal support wepay account. 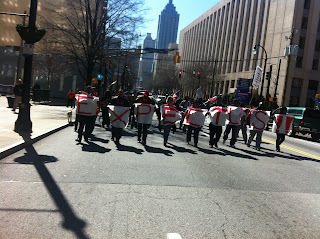 When Occupy Atlanta decided to fight along side Higher Ground Empowerment Center, other motives were made clear upfront. Vine City is one of Atlanta's most under served communities, parts of it resemble post Katrina New Orleans. The hope was that saving the Church would build momentum for general Vine City improvement. This past weekend a third community meeting was hosted at Higher Ground Empowerment Center. 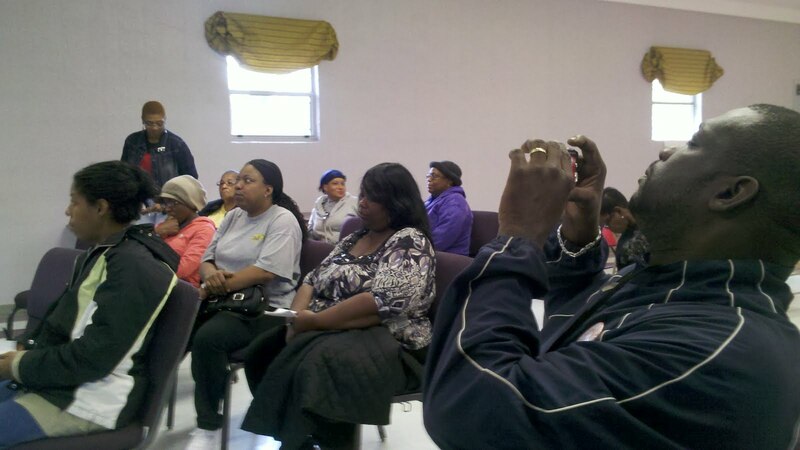 The focus of the meeting was to create action items around issues that members of the community identified as priorities for not only Vine City, but English Avenue as well. After greetings and introductions we broke off into four different brainstorming sessions. 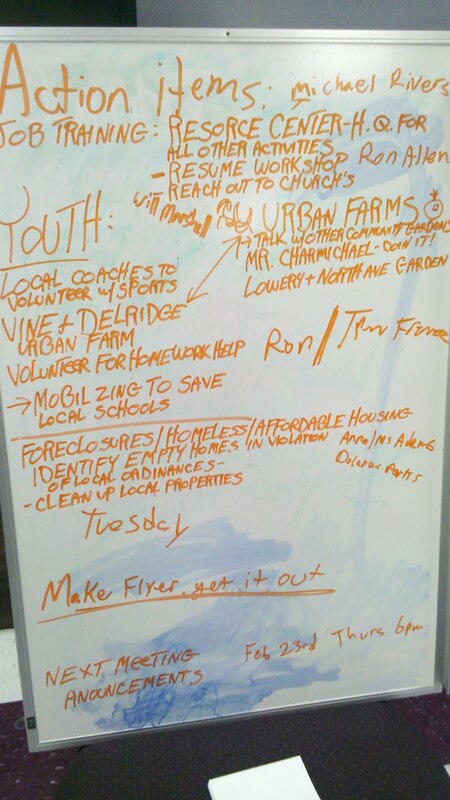 Issues addressed included, homelessness, foreclosures, youth services, jobs, and urban farming. Each break out session had a note taker and a spokesperson who's task it was to report back to the group. Action items were developed after the report back, and each action item was assigned to someone in the room. The energy in the room was great, and it's exciting to see folks from Vine City and English Avenue identifying the changes they want to see and articulating the steps that need to take place in order to implement those changes. 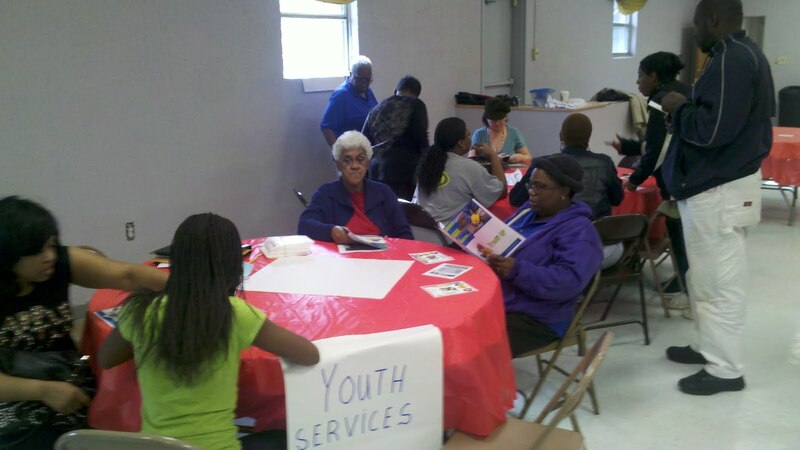 American Friends Service Committee hope to facilitate youth services in Vine City that would be open to English Avenue youth as well. 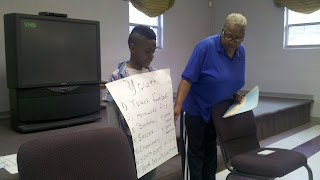 Our goal is to start an SAT tutoring program once a week, start a weekly Be The Change Curriculum, and build towards monthly youth organized events in Vine City. Last week Professor Pete Rorabaugh invited a few of us to speak with several of his classed about what led up to the Occupy movement, and the role wealth desparity plays in forming and shaping the Occupy movement locally, nationally, and globally. It was exciting to be surrounded by folks that were geniunely curious about the movement, and had not yet engaged with it to date. 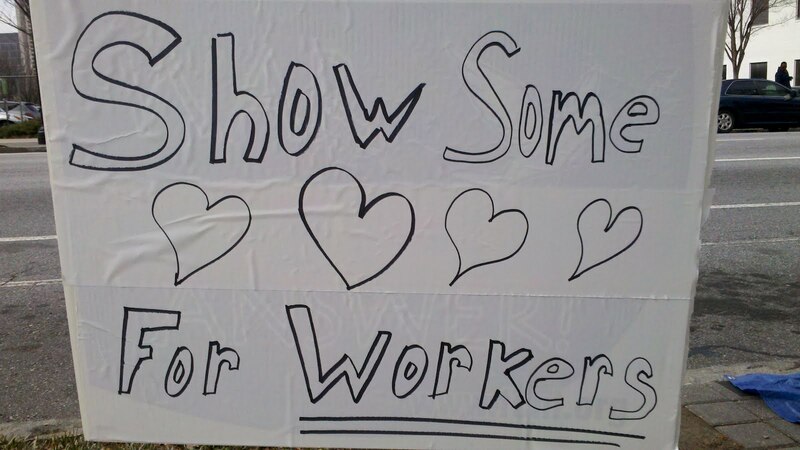 One of the classes has the assignment to cover the Occupy movement from a journalistic point of view, we strongly encouraged them, as I am now encouraging you, to come out on Valentines day and show some love for Atlanta's workers! 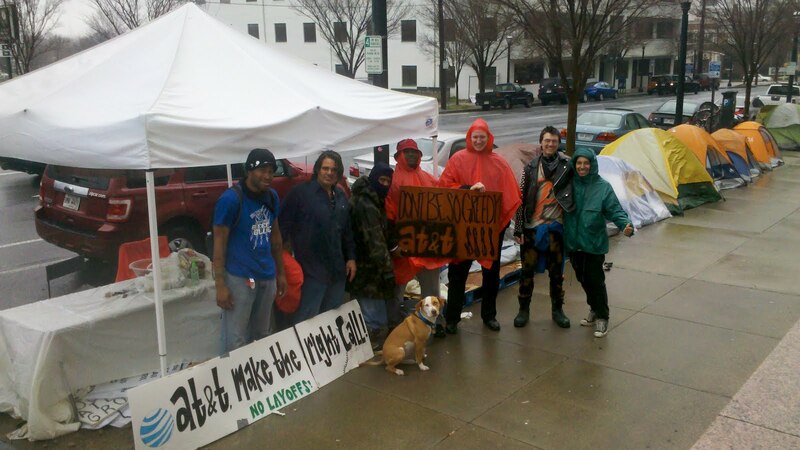 Walkupy, a mobile occupation, reached it's final destination this past Sunday on their 750 mile journey from Washington DC to the King Memorial site in Atlanta. At the King historic site Walkupiers took turns telling stories from the road, and why they were inspired to make Dr King's tomb their final destination. "This Mobile Occupation aims to unite everyone in an effort to envision and create a new kind of society in which the needs of all human beings are put first. Our next march begins December 1st, at the Martin Luther King Jr. monument in Washington, D.C. We will march approximately 17 miles per day until arriving in Atlanta, Georgia. Our date of arrival is not exact, as daily schedules are always subject to change according to health and safety concerns. Along our route, we will visit other Occupations and public spaces such as universities. 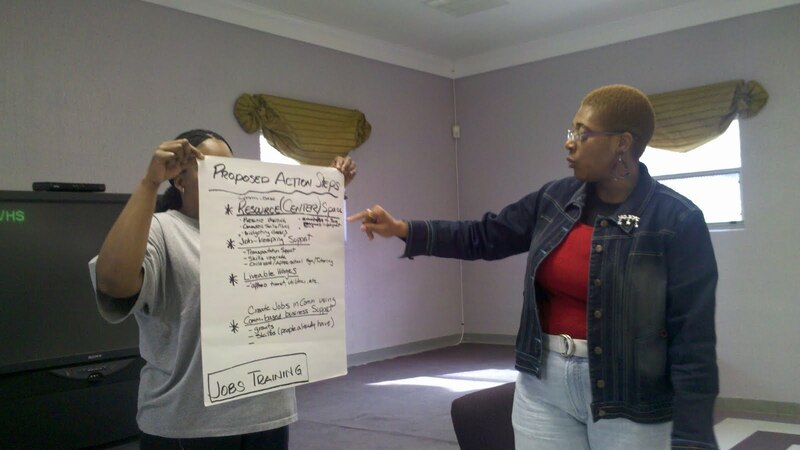 Our facilitation team will hold Instructional General Assemblies in order to introduce and spread the concept of horizontal leadership, and we will discuss the history and significance of marching and non-violent civil disobedience as forms of protest. We feel that these methods of demonstration are the next logical step that should be taken beyond stationary Occupations. Mobile Occupations attract attention to the Occupy Movement while allowing us to reach out to the public in person. 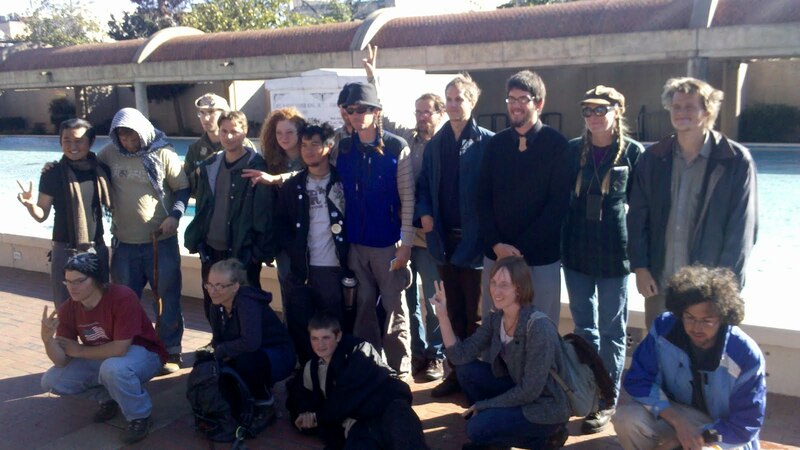 They demonstrate the dedication, determination and conviction of the Occupy Movement. 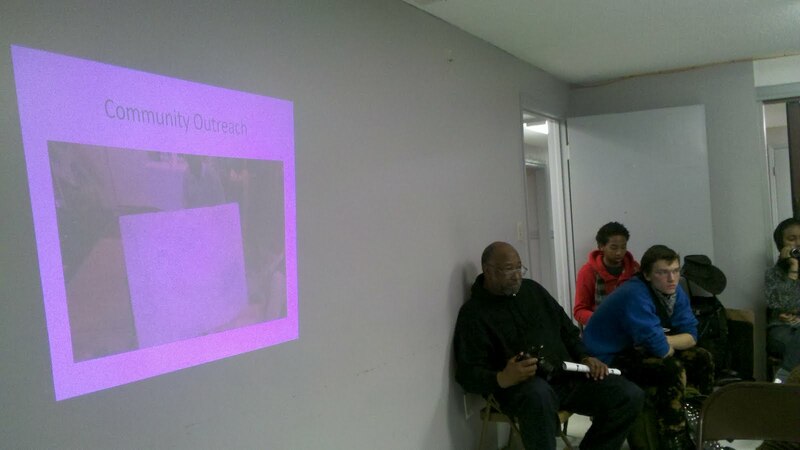 They provide a mobile example of the community Occupy is working to create. Long distance marches also demonstrate our willingness to sacrifice even our health, comfort, stability and safety in support of the Occupy Movement and its ideals." 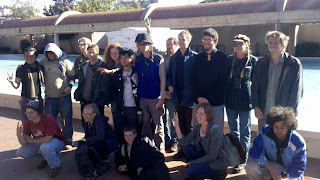 After taking a much needed break many in the group plan to continue to participate in traveling occupations, with some in the group headed to Chicago and others in the group walking from San Dieago to New York. 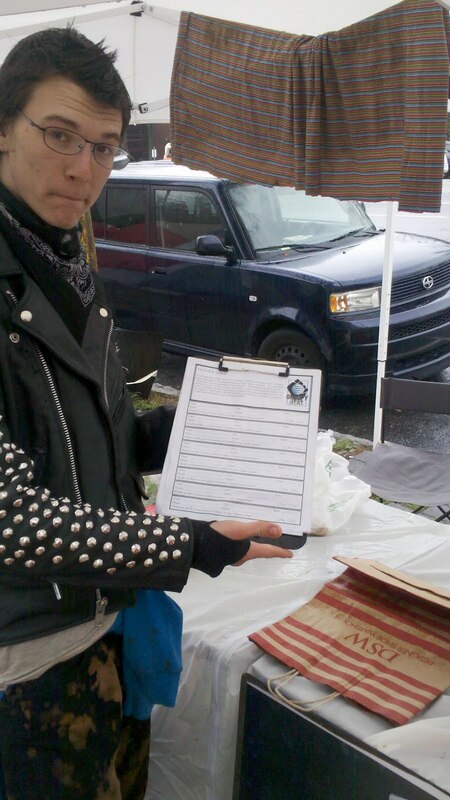 The traveling occupation always goes out of it's way to stop by local occupy movements to provide a helping hand and build an occupy network. 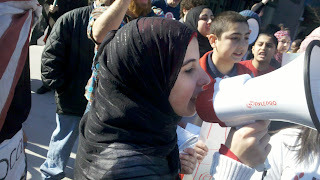 On January 28, 2011, one year ago, Egyptian demonstrators asked for their basic human rights. They bravely faced forces of oppression with their bare hands. Hundreds were killed and thousands injured for life. Today, one year later, these forces are still killing and imprisoning thousands of courageous men and women, not only in Egypt, but across the globe. 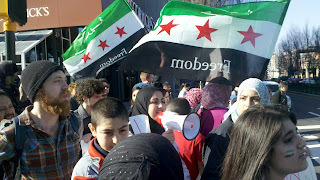 The fight that started on that day inspired millions from Damascus to Oakland and from Cairo to Atlanta. Today we join forces in support of all the people fighting for a better life. Today we stand up together for a free Egypt, a democratic Syria, and fair America. Come join the Egyptian, the Syrian, and the Occupy Atlanta communities in a rally for a better tomorrow. “After thirty years of human right violations and corruption, Mubarak was removed from office by a popular uprising. Mubarak’s handpicked Supreme Council of the Armed Forces (SCAF) stepped-in to continue and even escalate the regime crimes. We all witnessed on TV screens the use of live ammunition against unarmed civilians, and the unprecedented violence against women. The American government aid of $1.3 billion to SCAF is unacceptable support to undemocratic criminal body. As American taxpayers and as humans we consider this aid a crime by association. We demand a complete and immediate stop of the American military aid to SCAF, and unequivocal condemnation of their actions.” Said Sameh Abdelaziz , with the Atlanta Arab American. - Issue a strong condemnation of the ongoing massacres in Syria, specially the escalation in the city of Homs. 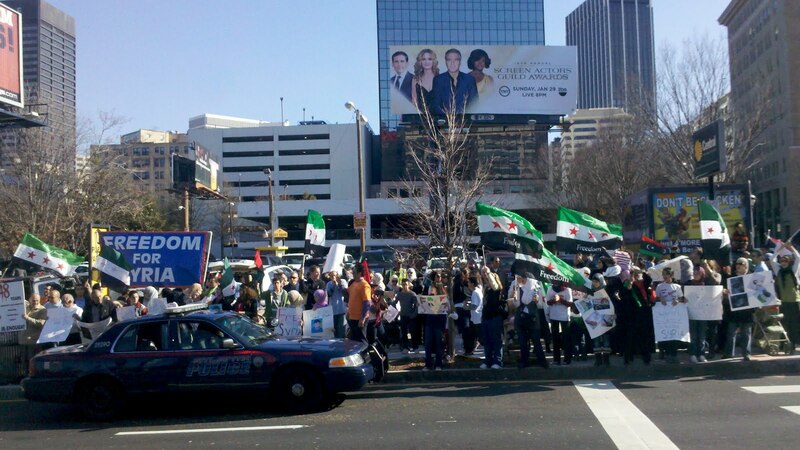 This past Saturday several different organizations including the Atlanta Arab American Committee,The Syrian American Counsel,Occupy Atlanta, and AFSC marched from Troy Davis Park to the CNN center. It was a beautiful sight to see so many people from different backgrounds, different nationalities come together with a call for a global revolution of values, calling for a world where everyone's voice is elevated to the same level, a world in which we all have enough resources to thrive. On behalf of the National Lawyers Guild, we urge you to cease your increasingly aggressive rhetoric aimed at provoking war with Iran. We remind you that any acts of aggression threaten the well-being of the people of Iran and the United States and violate international law, including Article 4, paragraph 2 of the UN Charter. We call on you to engage in good faith diplomacy concerning the Iranian nuclear program. Further, you are obligated not to merely disavow United States involvement in acts of terror, but to publicly condemn such acts regardless of who the perpetrator might be. In particular, we refer to the recent assassination of Iranian nuclear scientist Mostafa Ahmadi-Roshan, widely believed to have been carried out by Israeli intelligence operatives. As the largest recipient of U.S. foreign aid, Israel must not be allowed to engage in such blatantly illegal actions. 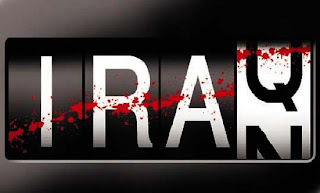 Such acts of terror serve only to strengthen the Iranian government’s resolve and ability to repress internal opposition, while sabotaging Iranian activists’ fight for human and political rights for their people. Finally, we call on you to lift the economic sanctions against Iran. The U.S. government should also end its campaign to pressure other countries into imposing sanctions. These measures hurt the Iranian people more than the regime and only serve to heighten tension. It is time for the U.S. government to cease its aggressive tactics against Iran. Threats of hostilities, sanctions, assassinations, and other acts of terror are inflicting tremendous suffering on the Iranian people while providing the Islamic Republic with a ready mechanism to shift the blame for a worsening economy. These actions create an atmosphere where genuine diplomacy calculated to peacefully resolve differences becomes impossible, and inevitably result in greater suffering for the people of both Iran and the United States. Instead, the U.S. must engage in serious attempts at diplomacy with Iran. In recent communications with the Iranian government, the Obama administration has threatened to take military action if Iran closes the Strait of Hormuz. (http://www.nytimes.com/2012/01/13/world/middleeast/us-warns-top-iran-leader-not-to-shut-strait-of-hormuz.html?hp). The U.S. ambassador to Israel has also stated that “all options are on the table” with regard to stopping Iran from developing its nuclear program. (http://www.time.com/time/world/article/0,8599,2104372,00.html). The U.S. has also taken increasingly aggressive steps to pressure European and Asian countries to cut ties with Iran in an attempt to “choke off” the nation’s oil exports. (http://www.nytimes.com/2012/01/13/world/asia/asia-buyers-of-iran-crude-get-assurances-of-alternate-supply.html?hpw, http://thehill.com/blogs/defcon-hill/policy-and-strategy/205875-obama-applauds-eu-sanctions-on-iran, http://www.reuters.com/article/2012/01/21/us-usa-iran-sanctions-idUSTRE80K03C20120121). The U.S. has also stepped up its efforts to sanction companies that do business with Iran. A major goal is to shut down Iran’s central bank, according to a senior administration official. (http://www.reuters.com/article/2012/01/23/us-nuclear-iran-usa-bank-idUSTRE80M1S820120123, http://www.state.gov/r/pa/prs/ps/2012/01/180552.htm).